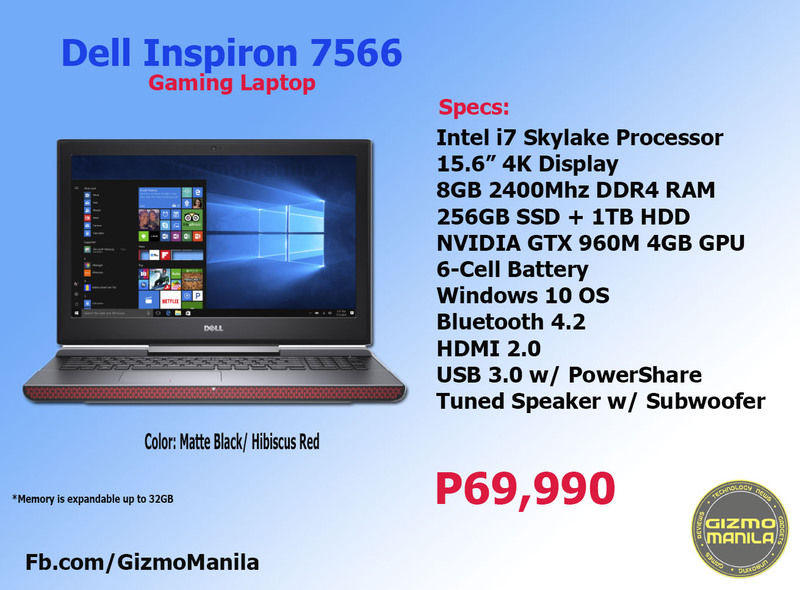 Home / dell / gaming / inspiron / intel / laptop / pc / Dell Inspiron 7566 Gaming Laptop, the most powerful Inspiron laptop today. Dell Inspiron 7566 Gaming Laptop, the most powerful Inspiron laptop today. Recently Dell Philippines unveils their newest addition to their Inspiron series laptop. It’s not your ordinary casual laptop as Dell finally step up and introduced Inspiron 7566, the Dell's first ever gaming laptop and the most powerful Inspiron laptop today. The Inspiron 7566 designed with extra-capacity heat exchangers with oversized piping to dual cooling fans. Equipped with the Intel 6th Gen SkyLake Processor and NVIDIA's GeForce GTX 950 and 960 GPU with 4-8GB up to 32GB 2400Mhz DDR4 Memory and 1TB Hard Drive. The Dell Inspiron 7566 Gaming laptop will be available in the market starting mid of December at the price of P49,990 for the i5 variant and P69,990 for the i7 variant, available in Matte Black and Hibiscus Red color. To learn more about the new Dell Inspiron 7566 Gaming Laptop and other Dell's latest product and innovations, visit Dell.com.ph/inspiron7566 or Dell Fb Page.